There are undoubtedly greater symphonies in the catalogue than those of Glazunov, but not many are so straightforwardly enjoyable, given performers who play them with passion. 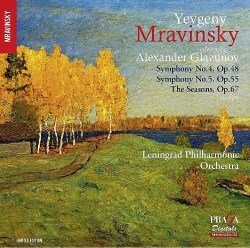 The two symphonies which provide the simplest pleasures, not least in the exciting finales, are Symphonies 4 and 5, both found on this disc of live performances by Yevgeny Mravinsky (1906-1988), now reissued in excellent sound by the enterprising Praga label. A great deal must have gone into the restoration of the sound: the 1948 recording of Symphony No. 4 is not noticeably inferior in quality to those from 1968, and there is none of the hiss or crackle which can sometimes prevent full enjoyment of historic recordings. Think rather of a sound quality similar to that found in good studio reissues from the 1960s. Nothing stands in the way of finding pleasure in these works. And these are genuinely historic performances. Lovers of Tchaikovsky are familiar with Mravinsky’s legendary recordings of the last three symphonies, and his association with Shostakovich is well-known (he premiered the Fifth, Sixth, Eighth, Ninth and Tenth Symphonies). His fifty-year association with the Leningrad Philharmonic Orchestra is paralleled only by Ernest Ansermet’s half-century with the Orchestre de la Suisse Romande, but, unlike Ansermet, was rarely able to travel abroad. For so many in the West, he is known only by reputation and recordings, so a release such as this, which increases our knowledge, is doubly welcome. The Mravinsky sound is characterised by driving rhythms but also attention to precise (if swift) phrasing. The sense of excitement is palpable, yet at the service of this energetic music. Listen, for instance, to the final movement of the Fifth Symphony. For me, the only comparable recording to bring out this intensity is the old Soviet-era recording by Rozhdestvensky, now available only as part of a box-set of the complete symphonies (Melodiya MELCD1001790) unless you are fortunate enough to find the coupling on the old Olympia disc. By a short head, I would place the Rozhdestvensky account ahead of the new CD, but that is not a reason not to enjoy the Mravinsky. The extracts from The Seasons are an enjoyable reminder of Glazunov’s mastery of the ballet. But few would buy this CD to hear excerpts when there are excellent recordings of the complete ballet, notably from Svetlanov (my preference) and Neeme Järvi, among others.